This paper talks about the AQAP influence in Yemen, its settlements and its ability to mobilize fighters. A number of factors led to the AQAP expansion particularly its social resilience that gave the organization new hideouts that provide protection and refuge for its members. The AQAP behavior towards political changes in the country provided additional momentum for the organization as well as the secret US-Yemen-run prisons and the dangerous mistakes of the US drones against civilians made the organization capable to recruit new supporters seeking retaliation and revenge. The lack of state control, weak economic infrastructure and the political conflict are all together contributed significantly to terror combating failure. The political conflict in particular provided a window for external funding for the AQAP that thwarted efforts of its elimination. The accelerating events and fighting fronts contributed also to the AQAP infiltration into local communities. The sectarian-based expansion grew largely following the Houthis occupation of the capital Sanaá in September 2014. The authority ignorance of population concerns towards the Houthi ideology to be imposed in their Sunni areas is also on top of factors that led to the AQAP expansion in Yemen. The US cooperation that remains active with Saleh and his allies the Houthis contributed greatly to the increasing of AQAP supporters. Strong AQAP presence includes provinces of Shabwa, Hadramout, Al-Bayda and Abyan. It uses the deserted area in Hadramout and the mountainous chain that links Shabwa, Abyan and Al-Bayda as safe refuge for protection against airstrikes. The AQAP has recently possessed the competence to run each area independently that made disparity in terms of AQAP weapons from one place to another. In Hadramout for instance, the AQAP preserved millions of dollars during its management of Mukalla from oil revenues, revenues of Mukalla port in addition to millions it looted from the Post Office in the coastal city. It also took control of weapons and heavy military equipment from government military camps when it held control of Mukalla, the capital of Hadramout when the Houthis were expanding in Aden by support from pro-Saleh forces following the 21 September 2014 coup and even during and after the UAE forces took command of Mukalla on April 24 2016. At the global level, AQAP (Yemen) appears to be the most dynamic terrorist organization. The unrest or the lack of state and its institutions are not the only reasons, but the organization is constantly trying to penetrate the complex social structure to obtain a tribal incubator in a country with more than 60 million pieces of weapons. It also exploited the tribal norms, which are considered to be recognized by the courts in Yemen as preliminary judgments that can be appealed through the judiciary. This matter contributed to the creation of a social incubator for AQAP in some areas where it resided or ruled. Al-Qaeda in Yemen could overcome the mistakes that its peers in Iraq and others regions have made. It tried to appear as a limited local extension that has nothing to do with the outside, so the organization imposed local leaders as an exterior leadership while the foreign leaders, especially those who came from Saudi Arabia, formed Shura council that rules from behind the curtains. The Yemeni society by its very nature is sensitive from any foreigner in the leadership hierarchy of any work that has a societal depth. The way the organization selects the leaders goes in line with its attempts to penetrate into the depth of the tribe as reflected in attracting Tariq al-Thahab when AQAP entered Baidha and Abu Ali al-Harithy when it infiltrated Shabwa and Marib. Moreover, AQAP attracted Jalal Baleidy Al-Marqashy (Abu Hamza Al-Zunjobary) in Abyan. Although this person was not qualified for leadership, it was the decision by the so-called Shura Council of the organization that ruled Jaar and Zanjibar in Abyan. Al-Qaeda attempts to infiltrate the tribal social system in its own enthusiastic literature (sons and poetry). The organization’s methods of mobilization on the basis of the tribe and the relationship with the organization's leaders have already contributed to the expansion of the organization in the absence of the government institutions. The secrecy and black sites that were established by the CIA and the Yemeni intelligence services (The Political Security and National Security) have been a major factor of the radicalization of a large group of those who were arrested on suspicion of links to al-Qaeda. According to previous studies, torture, concealment and solitary confinement of those detainees was a key driver of their joining al-Qaeda. These intelligence services are working tirelessly outside the authority of the Yemeni and international law, so they commit catastrophic idiocy through torturing people, pushing those people to engage in AQAP for revenge. These prisons seem to be returning in the governorates that were liberated from the Houthis and forces loyal to former president Ali Abdullah Saleh. In two separate investigations published in June 2017, Human Rights Watch and the Associated Press reported that 18 secret prisons in Aden (south of the country) and Hadramout are being run by the United Arab Emirates - the second largest partner in the Arab Coalition supporting the internationally recognized government after Saudi Arabia - or at least by a paramilitary force affiliated to the UAE, with the knowledge of US investigators. The details of those investigations indicate that those prisons are very similar to the American black sites. Washington announced that it gave up this program, although it remained secretly even in the era of former President Barack Obama. The mistakes of UAVs, and these mistakes do not only leave a human tragedy but – because of the nature of Yemeni society - push for revenge. When the victims are children or women, tribal men engage in al-Qaeda as recruits for revenge, or at least make the tribal areas open to elements of the organization, including foreigners. Al-Majalah (2009) and the January 2017 massacre in the village of Yakla in Baidha (in the center of Yemen) clearly indicate the reaction of the local population, which seeks revenge, even children. After the Houthi invasion of the Yemeni capital Sana'a (September 2014), the expansion of Houthis on the basis of sectarian sorting, the attempt by the authorities to ignore the population who fear that Houthis impose their faith (Zaidi close to Shiites) on the Shafi areas, and the American cooperation with Saleh party and his allies of Houthis. All these factors have contributed to push the organization and its elements to defend “Sunnis” areas against “Shiites.” Therefore, ignoring the demands of people through a political solution that enables Houthis to retain greater power, will result in increasing the sectarian sorting that only helps the Houthis and al-Qaeda. These reasons, along with the absence of the state; the complexities of economic and social conditions and the circumstances of war, represent fertile grounds for Al-Qaeda to mobilize and attract more fighters within its ranks. This is reflected in the AQAP influence areas, its military strength and combat capabilities and the number of its followers and supporters. But the influence of the organization has increased over the past six years in four Yemeni governorates. Specifically three of them represent what can be described as the areas of the traditional spread of al-Qaeda in Yemen, in a geographical area more than 70 thousand kilometers. Those governorates, including Baidha, Abyan, Shabwa and Hadramout, represent areas of clashes between government forces and elements of the organization. The organization uses mountainous chains that form a sort of geometric shape between Abyan, Shabwa and Baidha as hides and training areas for new recruits because of the difficulty to be targeted by airplanes. They also have a tribal depth in those governorates to which some of their leaders belong. An oil governorate locates in the east of Yemen. It is one of the most prominent governorates where the AQAP organization has strong influence and the tribe presence is more than the presence of the state. The governorate has been marginalized by the successive governments under Saleh. This growing structural imbalance in the country increased after the Houthi invasion of governorates, and security has become weak, so the organization uses Shabwa as a refuge to resolve differences between rival clans or between individuals who refer to the organization. Its area is about 47,728 km and it has coasts (neglected) that the organization has been able to use to obtain arms and reinforcements through the sea from similar groups in Africa. The organization extensively centers in Azan and it used to have sites in Baihan. These towns were under the control of the organization taking advantage of the absence of the state as well as the Houthis extension to the governorates. As the government forces arrived, they experienced violent confrontations with AQAP which then withdrew its elements into rural areas and mountains. The government forces liberated the whole coast of Shabwa and deployed forces to continuously secure the country's maritime border in August 2016. The elements of the organization dispersed in several locations (hides) between the towns of Mayfa’ah and Al-Saeed. On 3 March 2017, residents said that helicopters - believed to be American - deployed troops in the vicinity of the village of al-Mahdara in Al-Saeed where clashes and explosions were heard in conjunction with strikes by helicopters on targets in the region. The Pentagon denied the implementation of any aerial landing in that area. Several areas in the same town witnessed several American raids during March 2017, including the "Yashbam valley" and several places around it. Shabwa is the governorate that witnessed a failed US landing that resulted in the killing of American journalist Luke Somers in the valley of Abadan in Nesab town in December 2014. A number of senior leaders of the AQAP organization are from Shabwa, including Anwar al-Awlaki, whom the United States described as one of the most dangerous leaders of the international organization. The Arab Coalition, via the UAE, has trained the so-called Security Belt forces to be deployed in the oil areas of Shabwa. This raised controversy about the presence of these forces in AQAP-run areas. Some information says that the organization gives a virtual victory for the UAE-trained elite forces in return for stopping any operation against the organization’s members in Azzan and other areas while some information says that the UAE requested direct US support to pursue al-Qaeda in Shabwa and other governorates. Abyan, south of Yemen, was known as the first stronghold of al-Qaeda in the 1990s when some jihadists returned to Yemen and were under the surveillance and observation from the Yemeni authorities until they disappeared in the rugged mountains of the governorate. Its area is about 21489 km. It is the eastern gateway to the Yemeni capital of Aden and one of the most important centers of the military and political weight in southern Yemen as President AbdRabbo Mansour Hadi and many of the country's military and security leaders belong to Abyan. Abyan was the most prominent governorate that witnessed the influence of al-Qaeda which announced its “Emirates” in Zanjibar and “Jaar”. The former president Ali Saleh was accused of handing over areas and camps in Abyan to extremists in 2011. The government forces liberated those areas from AQAP in August 2012, but they fell again due to the expansion of the Houthis, taking advantage from the coup in the center, which prompted the Arab Coalition to intervene to liberate those areas. The organization is widely deployed in the rugged Marrakesh Mountains, the main stronghold of al-Qaeda since the mid-1990s, located between the coastal city of Shakra and the directorate of Ahur, almost 200 kilometers east of Aden. Abyan witnessed a wide bombardment in February 2017 from the American battleships based in the Arabian Sea. The government forces, backed by the Arab Coalition, launched a large campaign in January 2017 to hunt down elements of AQAP in those mountains that witnessed wide-ranging clashes. The government forces were able to liberate the center of Abyan (Zinjibar) from elements of the organization in a military campaign that lasted between May and August 2016. Many leaders in al-Qaeda in the Arab Peninsula are from Abyan, including the founder of Al-Qaeda in Yemen, Nasir al-Wahishy (Abu Basir), who was killed in a US raid in 2015, and Jalal Belaidi al-Marqashi, who was also killed in a drone raid in February 2016 as well. Residents said on March 3, 2017, that US carried out air and sea troops landing in the village of “Mughan” in the Shakra coastal area overlooking the Arabian Sea in the town of Khanfar in Abyan. Al-Qaeda in the governorate of Al-Bayda was not as resonant as its fellows in Shabwa, Abyan and Hadramout, but the organization started brightly in mid-2011 when elements of the organization killed a number of Yemeni soldiers in the town of Rada'a. Sheikh Tariq al-Thahab was accused of being behind the operation. In January 2012, the organization did rise up again when al-Thahab and a group of gunmen carried out an attack on the city of Rada’a and took over the Rada'a archaeological Castle,() Al-Amriya Mosque(), the Security Department of Rada'a and a number of vital facilities, while all the army and security personnel disappeared from the city. A tribal mediation resulted in the departure of AQAP elements from the government institutions in return for the release of brother of Tariq al-Thahab (Nabil) and Nasser al-Muthafari from the Political Security prisons. AQAP elements actually withdrew to the neighboring town “Al-Rabiee” but Tariq al-Thahab was killed days later by his brother Hizam al-Thahab in their village of Kaifah. After the organization left Rada'a, some elements of the organization were stationed in a valley close to the center of Al-Bayda city, specifically in the village of Mamdud, which belongs to the town of Al-Zaher. Several raids were launched, killing about 14 people. In Al-Bayda, the organization began a new phase of revenge. A large number of officers, especially political security officers in the city - a branch of the Yemeni intelligence - were assassinated. In order to avoid oppositions with the population, the operations also targeted the Houthi leaders. These are most of the events in 2012. After the appointment of Maj. Gen. Al-Dhahiry Al-Shadadi as governor of al-Bayda governorate (September 2012), he was able to reduce the influence of al-Qaeda by carrying out a number of measures that would have reduced the organization within the governorate. In the town of Wold Rabee Kaifah, al-Shaddadi launched a battle with al-Qaeda in Kaifah and then a tribal mediation intervened and resulted in a treaty between the government and al-Qaeda to deport all the new arrivals from Kaifah. The Yemeni government was able to hold a political festival on the first anniversary of the election of Hadi as president in Al-Manaseh village, the birthplace of Tariq Al-Thahab. In the capital of Al-Bayda, al-Shaddadi managed to sign an agreement with the tribes of al-Zaher to expel elements of al-Qaeda organization, and that what has been really done. But what prompted the elements of the organization to return to fight in al-Bayda was the collapse of the state and the Houthis attacks on tribal villages based on a sectarian-reprisal motive. When the tribes faced the expansion of the Houthis, al-Qaeda elements returned to fight against the Houthis. Most of them were originally from the tribes and returned to defend their villages. When al-Qaeda took over the city of Mukalla, the center of Hadramout governorate and consists of a strategic port (Mukalla Port), most of the members of AQAP organization left al-Bayda to Mukalla. The Houthi group invaded these villages and towns, and the tribesmen continued to fight as a popular resistance. When Mukalla's government forces managed to liberate Mukalla from AQAP, the al-Qaeda elements returned to al-Bayda. The Al Humaiqan tribes attempted to prevent al-Qaeda from setting up any camps on their territories so it established a camp in the town of al-Soma’ah and another camp in the directorate of Ould Rabie. Early this year, the US airliners continued to fly over al-Soma’ah town and killed leaders of the first ranks in the AQAP organization, so al-Qaeda leaders and members began to leave the town. After multiple raids in March 2017, they left the town to unknown locations(). Translation errorIn the town of “Ould Rabie,” two major operations took place. One of them was the US landing in the area of Yakla where several civilians were killed. On March 3, the area also witnessed raids by US aircrafts with dozens of rockets that targeted many positions of AQAP pushing the organization leaders to leave the area, except those who belong to the same town. The organization in al-Bayda has not military power like the one it had in the past five years, but its members, who are from the tribes of the governorate try to integrate among the tribes resisting the Houthi coup that is supported by the forces of the former president Ali Saleh, who exploited the war against the people of al-Bayda as an opportunity to avenge the tribes that obstructed the movements of Republican Guard Camps in 2011. In the last few years, Al-Qaeda's military capability has fallen to the lowest level. It has only 20% of the power that it used to have before they were hit by the Arab Coalition and the United States, in addition to their field losses due to the war they are trying to engage in with the Houthis on a sectarian basis. AQAP tries to take its breath to fill its rows and win new supporters() from AQAP branches in neighboring governorates. Hadramout is located east of Yemen and occupies 36% of its area. It consists of 30 districts, with its capital Mukalla. It is bordered by Saudi Arabia from the north and by the Arabian Sea from the south. 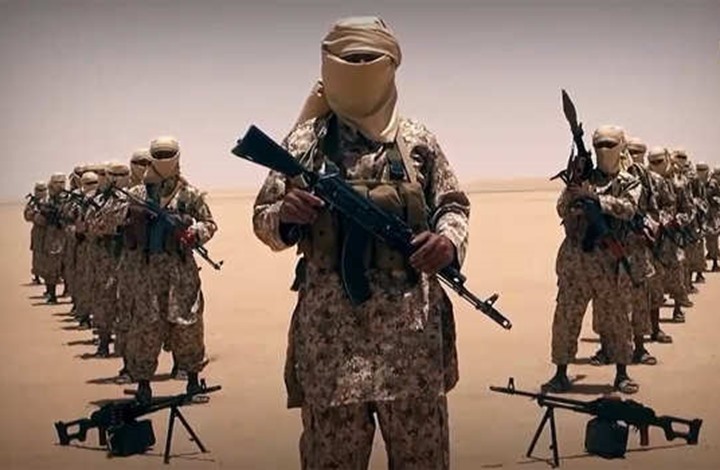 In 2015 and 2016, Hadramout seized the spotlight in terms of al-Qaeda, after AQAP took control of the city of Mukalla in a suspicious deal as the Army and security forces handed over camps to elements of the organization in April 2015. It is believed that Saleh was behind the handover. Clashes erupted between al-Qaeda members and the local tribesmen. The clashes continued until the government forces liberated Mukalla in April 2016. The organization took over several government buildings, including the Presidential Palace and the headquarters of the Second Military Region. Al-Qaeda freed 300 prisoners from the Central Prison in Mukalla, including Khalid Ba-Tarfi, whose several photos inside the Presidential Palace were circulated in social media. AQAP elements also attacked Mukalla Police Station and the building of the Local Authority of Hadramout. The withdrawal of the Yemeni army from its sites allowed al-Qaeda to acquire very large quantities of advanced and sophisticated weapons, including RPG and armored vehicles. Mukalla was transformed into a state governed by the AQAP organization with financial assets estimated at about $100 million, which came from the looting of bank deposits and revenues of the country's third largest port. If the Islamic state in Syria took al-Raqqa as its capital, al-Qaeda in Yemen tried to take the coastal Mukalla city, southeast Yemen with half a million population, as its capital. Al-Qaeda fighters have canceled taxes on residents and launched speedboats driven by fighters carrying RPGs to impose charges on ships traffic. They also used to make propaganda videos about paving roads in the city and providing hospitals with their needs. The organization's control of Mukalla represented the largest material gain for al-Qaeda. The amount looted from the Central Bank and revenues from the port were sufficient to fund the organization and to allow it to operate, at the level it is operating now, for at least ten years. Along with the port of Mukalla, the organization also took over the port of Shahr, and its militants began to impose tariffs and custom fees on the movement of shipping and trade. The organization has turned into a commercial enterprise that sells fuel even to stations under the control of the Yemeni government. The organization has offered the government to sell it crude oil for a share of the profits. The government gets 75 percent, compared to 25 percent for the organization, but the government rejected the offer. Government officials in the Ministry of Transport estimated that the organization was earning $5 million per day! But the organization did not forget to win the people’s friendship after receiving the money. The organization already started to make roads, and repair bridges. It used to show regular videos of its members and claim that it carries out such projects with funds from groups such as Ansar al-Shariah and the sons of Hadramout. It used such names as part of its efforts to assert its local origins. In a video recording released on February 28, 2016, members of the organization showed up the delivery of free medical supplies and equipment to kidney and cancer units at a local hospital. The supply boxes were sealed with a label of a Western drug company. However, the organization was subjected to multiple drone strikes. More than 50 members of the organization in the city were killed in one air raid in January 2016. In April 2016, the government forces launched a large-scale military operation to liberate Mukalla from the grip of the AQAP organization. The organization was expelled from the city and its members were distributed among other governorates. Many of them disappeared since the beginning of 2017 as the US strikes increased in remote villages, Shahr, Ghail Bawazir, Sayoun and different areas of Wadi Hadramout. Many analysts believe that the UAE forces, with a green light from the United States, made a deal with al-Qaeda in return for their withdrawal from Mukalla, especially that AQAP members were not hit by the Arab Coalition or US drones, despite their withdrawal with a strategic weapon that they got from the security forces, including the counterterrorism weapons, and weapons from stores of the 27 Mika Brigade and the 190th Air Defense Brigade in Al-Rayyan, and the Al-Adwas stores that contained Katyusha rockets. Those stores were considered the back of the former Eastern Military Region. 1- A camp in the area of (Zamakh and Menukh), located in the north-east of Al-Abr border outlet, 90 km deep in the desert, between the Yemeni area of Khashim and Saudi area of Kharkhir. 2 - A camp in the area of Redat al-Sayyar, close to the Yemeni-Saudi border as well as to the Al-Abr border outlet. Members of gangs of drugs and bandits joined that camp. It is believed that many cases of the looting of passengers and incidents of banditry on the road of Al-Abr were carried out by these gangs under the protection of al-Qaeda. 3 – A camp in the Amad Valley in Shaab Mankhop, near Hadramout Valley. 4 – A camp in Bashdada in Rakhia Valley. Since 2002, the American aircrafts have carried out 197 air strikes that killed several people on the Yemeni soil. There were 16 air strikes by aircrafts and 178 raids by drones. The US landing operation in Yemen took place only four times, the last one of which was the landing in Yakla in al-Bayda. It is hard to say that the United States achieved its objectives in the four land operations. It lost or almost lost. These attacks killed between 1019 and 1249 members of the organization, including senior leaders, including Nasser al-Wahishi, founder of al-Qaeda in Yemen and al-Qaeda general manager (killed in June 2015) and Anwar al-Awlaki, who was believed to be the head of foreign operations (killed in September 2011), al-Qaeda’s Mofti, Ibrahim Salman al-Rabeesh, (Killed in April 2015), Harith al-Nadhari, the legitimate official of the organization (killed in January 2015), and Said al-Shihri, deputy Emir (killed in June 2013) (). The organization counted its operations in Yemen against the Yemeni government forces, the Arab Coalition and the Houthis within one year up to 290 operations. (Note: the AQAP organization adopts the Hijri calendar and these statistics are for the year 1437 AH, so Abaad Center could not make sure about all operations)(). The military operations against al-Qaeda in southern Yemen seems to be a political cover. In the process of liberating Mukalla and the subsequent operation, announced by the UAE Army on August 3,2017 in Shabwa governorate, indicate that no real operations occurred between elements of the AQAP organization and those forces. Reports say that AQAP withdrew and moved to Abyan and Al-Bayda, south and center, and to the northern governorates, specifically the governorates of Al-Jouf and Marib, north and northeast of Sana'a. These two governorates are on the Yemeni-Saudi border. This means that Washington and Abu Dhabi are deliberately or unintentionally increasing Saudi fears of the AQAP organization by pushing it toward the borders of the Kingdom that already faces the Houthis on its borders. There are attempts by AQAP to return to al-Bayda governorate that borders Shabwa and Marib where tribes and local authorities have concerns that the aim maybe the deployment of US-UAE troops to fight the organization in those governorates and the use of war on AQAP as a political cover to extend the influence of the UAE on oil fields in Shabwa and Marib, especially since the UAE has started to fund tribal groups to rebel against the State and local authorities in the tribal governorates, especially Marib. () Qasem Al-Raimi (Abu Huraira Al-Sanani) was appointed as a successor to his predecessor Nasser Al-Wahishi "Abu Basir" who was killed in June 2015. () Abaad Center has got this information through the Center's researchers in the governorates covered by this report. () Tribal Sheikh and a local official talked to Abaad Center’s researcher on 15 July 2017- Zinjibar. () A historical castle in the middle of the city and through which anyone can control the city. () A historical mosque built by the Sultan Al-Tahiri Amer bin Abdul-Wahab, Al-Tahiri State 855 - 923 AH / 1451 – 1517C. () A tribal Sheikh from Al Humaiqan tribe spoke to the Abaad Center’s researcher on phone on 2 July 2017. () According to local residents, who lived with the leaders of the organization, in their talk to researchers of Abaad Center.